A first class museum intended to preserve the area's history and become a major heritage attraction. The Museum's concentration is on transportation, natural history, changing life, and will also feature special collections and visiting exhibits. The museum is a major anchor in the Canal Place Heritage Tourism Area—a key partner in the economic revitalization of Cumberland and Allegany County. It also serves as a physical link between Canal Place and the Historic Downtown Mall on Baltimore Street. Open: May - December; Tues. - Sun., 10:00 AM - 4:00 PM Other times by appointment. Special tours, receptions, or parties can be arranged. Housed in the historic 1913 Western Maryland Railway Station, the Cumberland Visitor Center of the Chesapeake and Ohio Canal National Historical Park invites you to explore the rich history of the C&O Canal and Cumberland. The western terminus of the 184.5 mile long shipping waterway, Cumberland served as the beginning point of much of the heavy shipping along the canal an a major boatbuilding center for the canal company. It was here the George's Creek coal was transferred to canal boats for shipment to Washington DC, and here that the boats returned nearly empty to begin the process over again. Hours and admission: open daily 9-5. Closed Thanksgiving, Christmas, NY Day. Admission is free. For group tours contact the visitor center. Where art and history meet. A charming mansion, built in the Transitional Federal Greek Revival style in 1843 for Judge Thomas J. Perry sits on the original location of George Washingtons Headquarters Cabin. It houses six renovated galleries on the first floor presenting new exhibits monthly; a costume collection, a permanent art collection including many original Wellingtons, an art library and landscaped gardens. Open: April-December, Friday-Sunday, 1-4PM. Available year round for special events, receptions and parties. In 2001, the City of Cumberland and the Allegany Arts Council formally joined forces to develop a plan for a downtown Arts and Entertainment District. Through a combination of creative marketing strategies, innovative tax credits and generous redevelopment grants, (not to mention great word of mouth and lots of regional press!) dozens of artists and their businesses have relocated to our growing arts community and purchased and renovated historic buildings, and have established residences, working studios and/or retail venues in Downtown Cumberland. Cumberland's City Hall was built in 1911, one year after a fire completely destroyed the 19th-century city hall and Academy of Fine Arts at this site. City Hall is particularly significant for its intact interior, including marbleized stone pillars. One of the outstanding interior features is a large mural painted on the rotunda dome. Painted by artist Gertrude du Brau, the mural illustrates the early history of the city and features a depiction of George Washington's military life. Join us at the Evergreen Museum, the 200 year old Trimble family ancestral home, officially recognized as a Maryland Historic Property since 1976. The Evergreen Mansion/Museum is located at the Evergreen Heritage Center. It features the original fireplace kitchen where slaves prepared family meals, a large double parlor with two fireplaces, chandeliers, and French doors for women in their long hoop skirts, plus quaint guest rooms where fireplaces provided the only source of heat within two foot thick mansion walls. Experience Brooke Whiting's collection of art that he amassed from a lifetime of world-traveling and collecting. His collection is housed in his family's historic 1911 bungalow and includes, but is not limited to, Asian Works of Art, Eighteenth-Century American Furniture, Tiffany Glass, Greek and Russian Icons, and Middle Eastern Rugs. His archives contain over 1500 volumes, ancestral documents from the eighteenth century onward, and various photographic materials and ephemera from his travels. group tours or for additional information at 301-777-8678. The 1899 school building houses displays of local history, including exhibits on the National Road, mining, industry family living, domestics and technology. Free admission but we do accept donations. Visit the Gordon-Roberts House and enjoy a soothing cup of tea, served by an elegantly costumed docent, as you embark on a memorable journey back in time. Strains of period music add to the ambiance as you walk the halls of this lovely 1867 Victorian home. Tours are offered year round, Tuesday through Saturday from 10AM-4PM on the hour. The Irvin Allen - Michael Cresap Museum, Inc.
Frontier home of Captain Michael Cresap, built in 1764. One of only 100 structures listed in "Colonial and Historical Homes of Maryland." Authentic centerpiece of pre-Revolutionary building in Allegany County. Repository of historic facts and artifacts dating from early 1700s to the present can be found on site. Constructed in 1811, the National Road, the first federally funded road, made Cumberland the Gateway to the West establishing mile marker one. Travel the road as it cuts through the Narrows in LaVale, a spectacular 1,000-foot breach between Will's and Haystack Mountains that many believe is one of the most picturesque sites in Maryland. LaVale's seven-sided Toll Gate House was the first constructed after the state took over ownership of its section of the road in 1835. "Make the Journey" on the National Road to the Thrasher Carriage Museum. Costumed docents transport visitors back in time to explore early transportation. Guides and interpretive signs offer a glimpse into the world of the elegant traveler. Stories of the clothing, activities, and lifestyles of Victorian Americans are interspersed with the fascinating details of remarkable vehicles. It is open Wednesday through Saturday from 10AM-4PM, Sundays from 12-3PM (March-December), and other times by appointment. A Moving Tribute based on the experiences of Vietnam_ Veterans of America, Chapter 172's members during the Vietnam War. The museum represents our story, as told in pictures, letters and through the personal collections of many of our members. Chapter members have made this display possible so that veterans, their families, educators, historians and school age children can better understand the experiences we shared and the sacrifices made by all who served in Southeast Asia. Call Chapter 172 at 301-777-7001 or toll free 1-800-482-8387 for museum hours and tours. This one room cabin, used by George Washington as a young aide to General Braddock, was built in 1754-55 and is the only remaining structure of Ft. Cumberland. Maintained and operated by the D.A.R. Cresap Chapter. The cabin is not open to the public but has large windows with an audio description. The Washington Street Historic District is a primarily residential neighborhood west of downtown Cumberland, home to the city's business elite, as well as social and political leaders. Washington Street is comprised of numerous high-style examples of mid-19th and early 20th century architectural styles, ranging from Greek Revival to Victorian, Colonial Revival to bungalows. Many prominent local citizens have resided on the tree-shaded street, including the president of the C&O Canal, state congressmen, and former state governors. 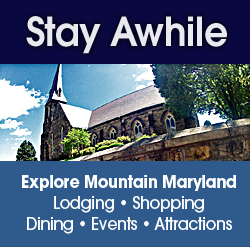 The Western Maryland Scenic Railroad round trip excursion, originating from Downtown Cumberland, Maryland, is an exciting mix of mountain scenery and rich transportation history. It’s an entertaining and educational experience for riders of all ages and interests with interpretive history and lively Main Street Districts at both ends of the trip! The Western Maryland Scenic Railroad also offers Murder Mystery Theater, Dinner/Club Service, The Santa Train, and North Pole Express Excursions. If you're traveling with a group, you can make your journey more exclusive by renting the caboose! For Special Group Rates contact the Group Sales Dept. at 240-920-6273 or email at groupsales@wmsr.com. The 1940's Westernport Station/Museum houses items on the railroads that were in our area, such as the Western Maryland, B&O and the C&P. Also on display are coal mining, local industry and business items and interesting conversation pieces of yesteryear. Woman's Civic Club of Cumberland, Inc.
A charming, pristine 1855 Victorian Home in the list of Historical Sites available for tours, bridal showers, weddings, birthday parties, anniversary parties, business and office meetings and other events. Capacity 100.